Inspired by the universal image of the moon in the night sky, the Satellight pendant lamp was designed by the Spanish designer Eugeni Quitllet for Foscarini. Quitllet describes himself as "Disoñador", which is a mixture between designer and dreamer. Awarded with prestigious international awards, this design is the beginning of a partnership between the designer and the Italian lighting manufacturer. The pendant lamp is made entirely by hand in Italy. The poetic lamp is presented as an absolute graphic and visual purity. 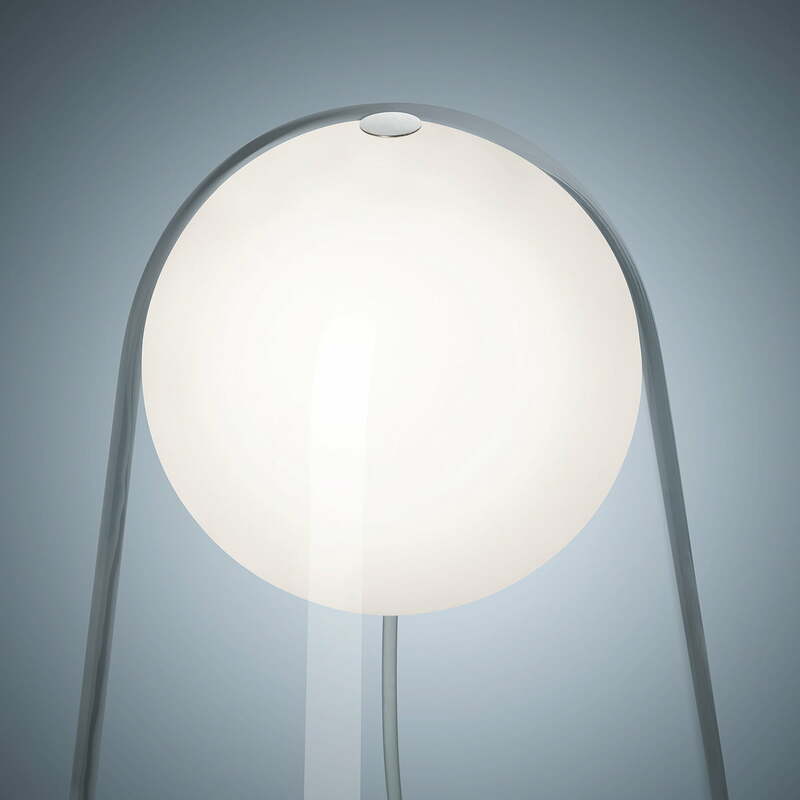 A mouth-blown, frosted glass ball that houses the lightbulb seems to float weightlessly inside of the transparent glass cone. From this, the impression of a discreet and light illumination alternative in a clear and open environment is created. The energy-efficient LED lamp emits warm, glare-free light, which can also be dimmed. Therefore, the Satellight pendant lamp works just as well above the dining table as it does above the kitchen counter or as mood lighting next to the sofa. The mouth-blown, frosted glass ball of the the Satellight pendant lamp for Foscarini houses the LED light source, which looks like it is hovering inside of the transparent glass of the outer cone. 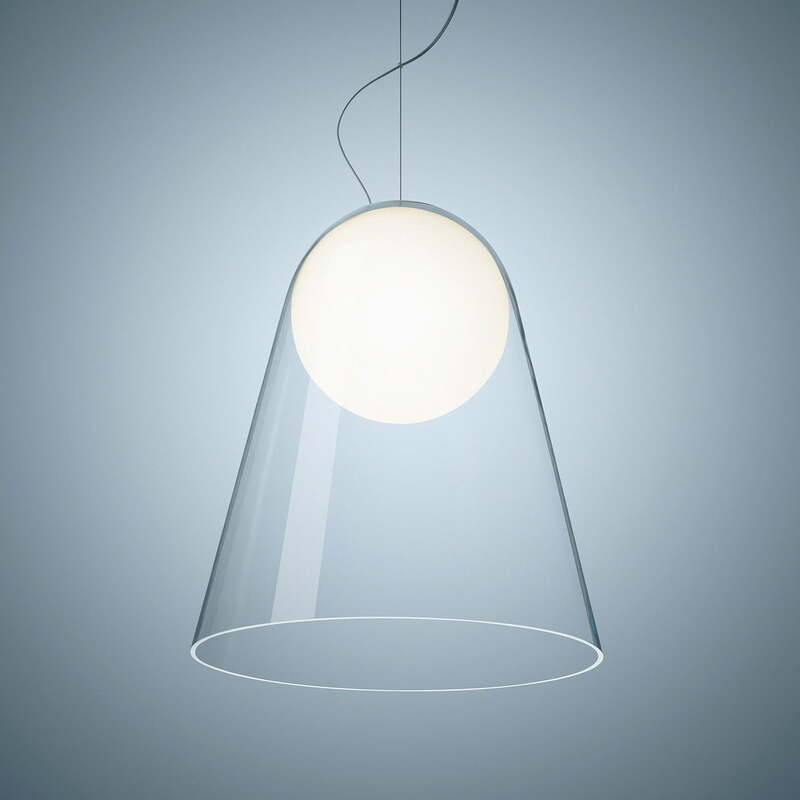 Lifestyle product image of the illuminated Satellight pendant lamp by Foscarini. The energy-efficient LED lamp emits warm, glare-free light, which can also be dimmed.